Noosa Australia's water activities around Noosa beach include very good surfing, both body and surf board, including the Malibu longboard that is enjoying a resurgence to popularity. The Sunshine Coast Australia is home to many successful professional surfers. As a consequence there are quite a few board shapers living locally in Noosa. A great place to buy an Australian surf board at a competitive local price. It is possible to hire all manner of watercraft, from hobby craft catamarans, put-put boats, jetskis, and sailboards right up to live-aboard house boats. 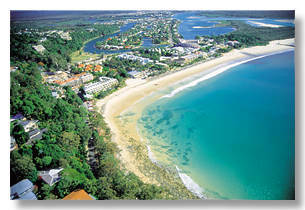 The mild Noosa Australian climate and huge variety of waterway encourages the sporting and casual fishermen alike. Bait and tackle are available in many localities. Many an hour can be spent trying your luck fishing in Noosa, Australia. The most southerly region of the Great Barrier Reef Marine Park, Lady Musgrave Island (a beautiful, sheltered coral cay), can be visited in a day from Noosa beach. However, many visitors choose to spend more than one day at such diving havens as Lady Elliot Island. Qualified dive masters accompany all dive cruises including cruises to the reefs off the Noosa shoreline. 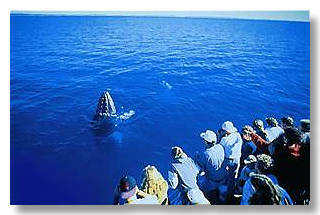 Deep-sea fishing cruises also operate from Noosa. From August until October each year, many pods of whales rest in Hervey Bay before proceeding south to the Antarctic Ocean; daily whale watch tours leave from Noosa beach to join the fleet of licensed boats for a wonderful experience with these magnificent sea mammals. Whether you are seeking a holiday with all the family or you desire a more select, relaxing break away, you will find your needs well catered for. Whatever your forte there is something in Noosa Australia for you - golf, tennis, lawn bowls, physical fitness, surfing, fishing, abseiling, boating, water-skiing, camel or horse riding, and so it goes on - or just do nothing at all but soak up our ever present Australian sun! !